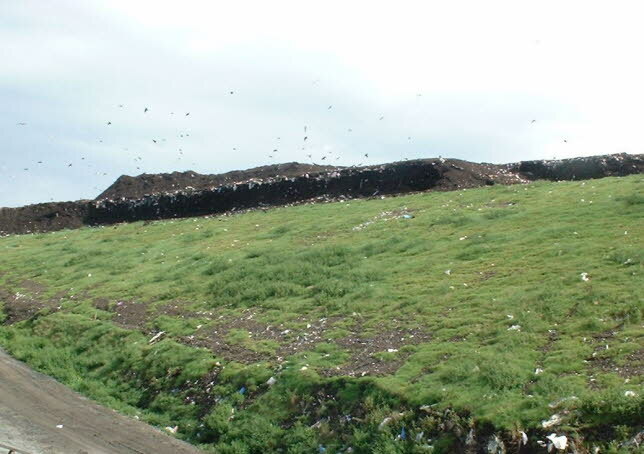 Well run landfills minimise their impact on their surroundings by the use of temporary cover material. Usually, temporary cover is soil or quarried material which is spread over the rubbish daily, and has many positive effects in reducing vermin and odour, wind blown litter etc, but uses up space which could be used for rubbish. The new solution seen here on this temporary slope, is to use low quality compost which greens up rapidly after seeding and is not prone to erosion.